Clients can often get confused and not understand the difference between these to disciplines and therefore not sure who can help them with their needs. So in this blog I want to share with you the differences so that you can be more informed and understand how either of these may work for you or your loved ones. Life Coaching is a way of providing people with personal support that is committed to their success and development. 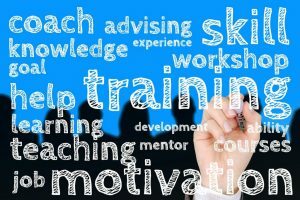 The coach is someone who will make a difference in the client’s life by supporting them and by encouraging their personal and professional growth. The coach helps the client identify where they are now, where they want to be and how to get there; and then keeps them on track until they achieve their goals. It is important that the life coach does not impose their own ideas on the client as it is about asking the right questions to draw the solutions from the client. Life coaching is not about being a therapist, mentor or counsellor, it is not about looking back into past experiences or emotional issues. Equally it is not a short-term measure to cope with crises. Life Coaching’s goal is to assist clients to define and achieve their goals. Life Coaching is looking forward and creating a desired future. Counselling is focused on the past as a way of making sense of the present. It is largely about explaining emotions, feelings and reactions, and the experiences that combine to make us the people we are. It is based on the premise that by understanding an event, and working through the associated emotions, we can reduce its power and move nearer to fulfilling our potential as human beings. In bereavement counselling, for instance, the client will be encouraged to untangle the complex mix of emotions they have about the death. By identifying the feeling, and giving it expression, it loses its power. Life coaching, in contrast, focuses almost exclusively on the ‘here and now’ and the future. Counselling is looking back to bring the client up to the present. Counselling is looking back and uncovering past events and working to get some understanding and to reduce the power of the emotions associated with them. Life Coaching’s objective is to assist clients to define and achieve their goals. Counselling’s Objective is to help the client to cope on their own. 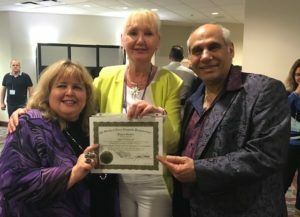 Flying High as a Licensed Master Trainer of NLP! 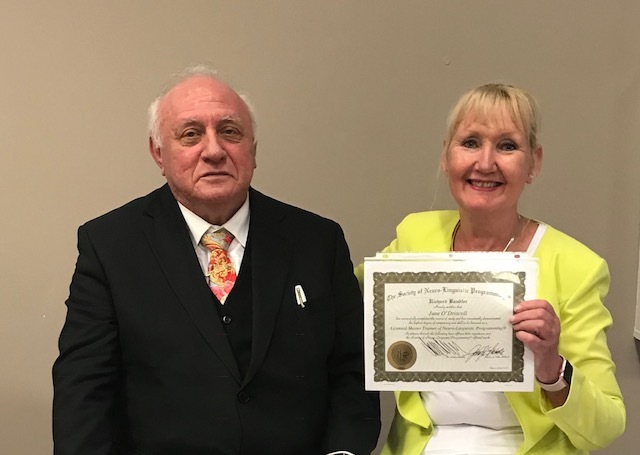 As this is the First Blog it gives me another opportunity to celebrate my recently awarded status as a Licensed Master Trainer of NLP, presented to me by Dr Richard Bandler (Co-creator of NLP) and John La Valle (President of the Society of NLP), in Orlando, Florida. 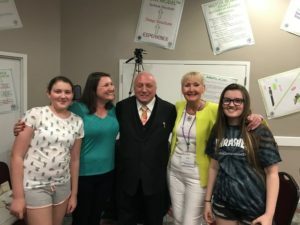 This was made even more special as my daughter Mandy and my granddaughters were in the audience. Of course, this wonderful experience would not have been possible if I hadn’t decided to finally get rid of my fear of flying, all those years ago. Now for those of you that have had any fears or phobias you will understand that this is not an easy thing to change yourself. Also like many of you I had created some very useful strategies to avoid my fears and still maintain a professional persona. What I hadn’t noticed though was that the ‘state of fear’ began to generalise in other areas of my life. This ranged from a fear of heights, a fear of bridges, a fear of escalators to a fear of stairs that was a lot of workarounds to maintain a professional persona. 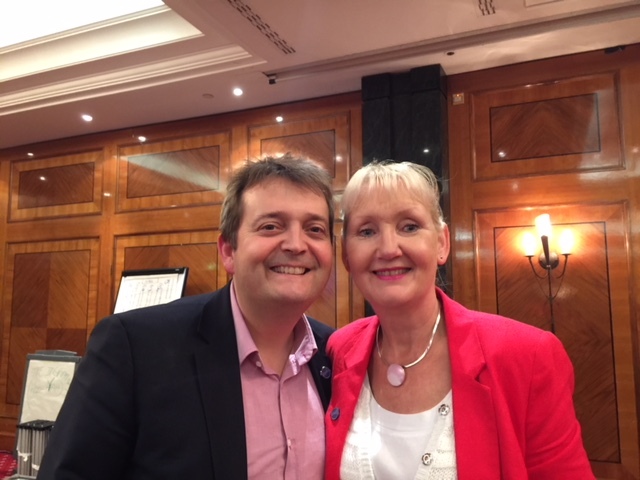 The day that my life changed was on Day 2 of a Licensed Practitioner of NLP in London at a Hotel in Kensington with 700 other people in the audience. 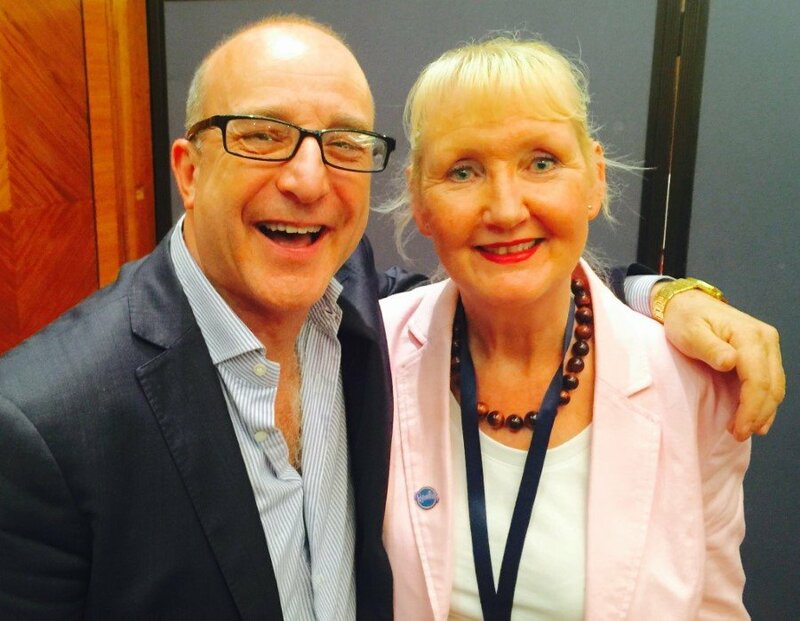 I didn’t know about NLP and had gone there in order to get Paul McKenna to get rid of my fear of flying. Well after my initial shock at being in a room with 700 people, who I thought were there for the same reason, I relaxed into the training. At the end of Day 1, I had met some great people, felt relaxed and thought about how I could integrate some of the exercises into some team building events. Day 2 arrived and this is where things were never going to be the same again. Dr Richard Bandler (Co-Creator of NLP) asked if any one had a fear of flying and I sank down in my seat, hoping he hadn’t noticed me, I was blushing, sweating and feeling like I wanted to run out of the room. Richard gave me a choice I could either go on the stage and change things or I could stay with the fear, for the rest of my life. With a choice like that it was obvious which route to take. Well the next 20 minutes were very relaxing, I remember laughing and feeling different about a lot of things. Richard had changed the disaster movies in my head and I couldn’t get back any of the bad feelings. As I opened my eyes and was going to leave the stage Richard whispered something in my ear and told me out-loud not to tell anyone on the course what he had just said. Even typing this is bringing a smile to my face, Richard had installed an auditory anchor that would be strengthened every time someone asked me what he whispered. We had a lunch break and many people came up to me and asked me what Richard said, which made me smile and the first thing I wanted to do was to go outside the hotel and look up to the sky, this was something that had never been possible before. Everything had changed and suddenly I had time to do things I wanted to do. The rest of that week I worked with lots of other students, staying late in the evenings practising, at lunch times, break times and fully immersed myself in the process. Lots of years have passed since then and I, with my great friend and Co-Trainer Geoff Rolls have trained many people with NLP to be Licensed Practitioners of NLP, Licensed Master Practitioners of NLP and recently Licensed NLP Coaches. 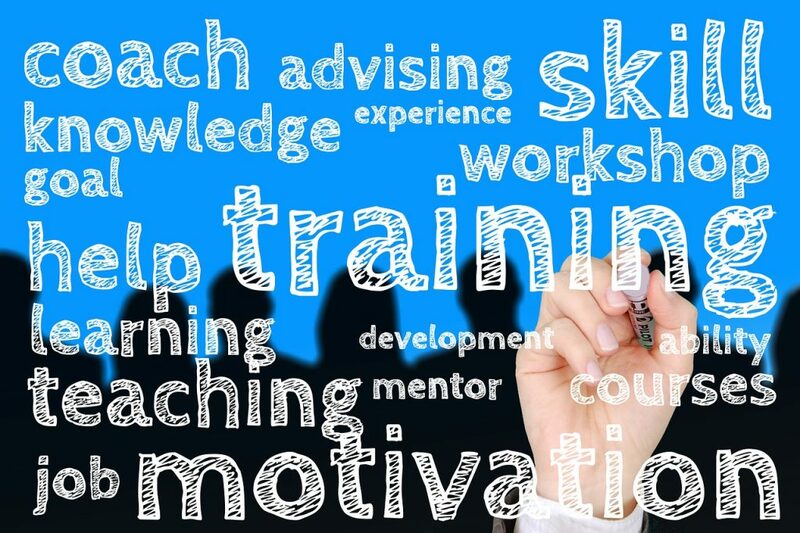 With our previous business experience we also train Accredited Coaching Courses and Clinical Hypnotherapy Courses. So when I look back, at one time I thought it was impossible for me to go on an aircraft to the USA. 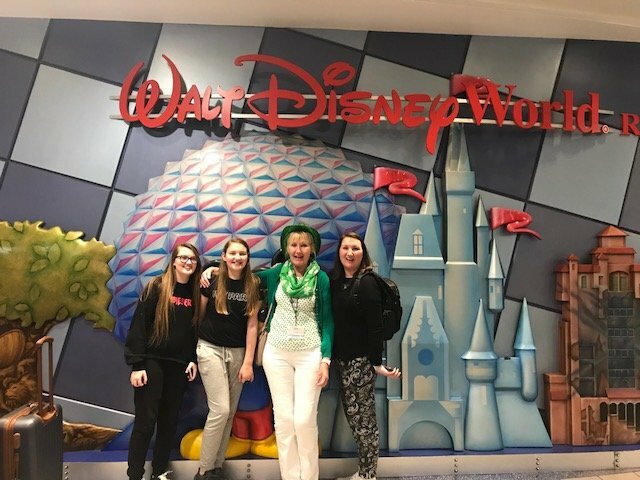 This also meant that I would never go to Disney with my children and in turn never experience this with my grandchildren, either. Isn’t it good to be wrong?